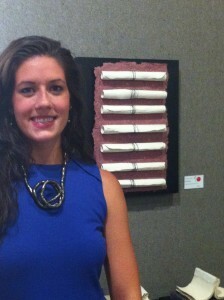 Emily’s sculptural work utilizes sheets or scrolls of paper-thin clay that resemble paper objects. 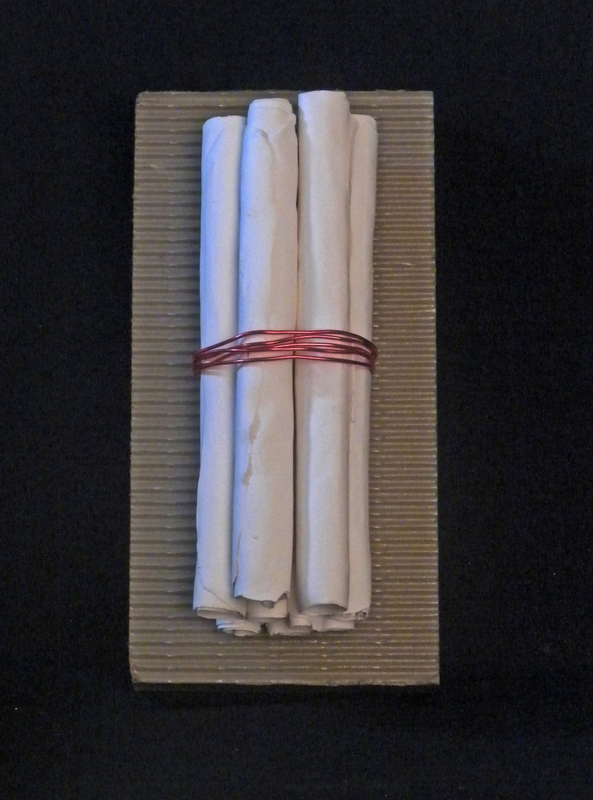 Scrolls of tightly wound sheets of clay are neatly affixed to a textured surface of contrasting color and material. Her design is sparse and very deliberate. Each object is carefully edited and presented to draw attention to the bare essentials of the image. The art object’s resemblance to a paper found object is truly so startling that the observer is obliged to move closer in to each of her works to figure out how they are made. The more you look, the more delighted you are at the discovery. At the most basic level, Emily’s works are absolutely fun to look at and strikingly displayed; at a deeper level, Emily’s work delves into that contemporary art dialogue of “what is art” and the juxtaposition of everyday objects in an artistic context that forces us to look again. Emily’s work emulates reality whereby the artistic recreation becomes the symbol of a new idea while planes, rockets, houses, and price tags are the image of product. 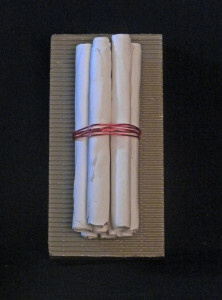 She works with white and terra cotta clay and casting slip primarily used for production. Casting slip allows her to create paper-thin sheets of clay, which then can be cut out and layered. 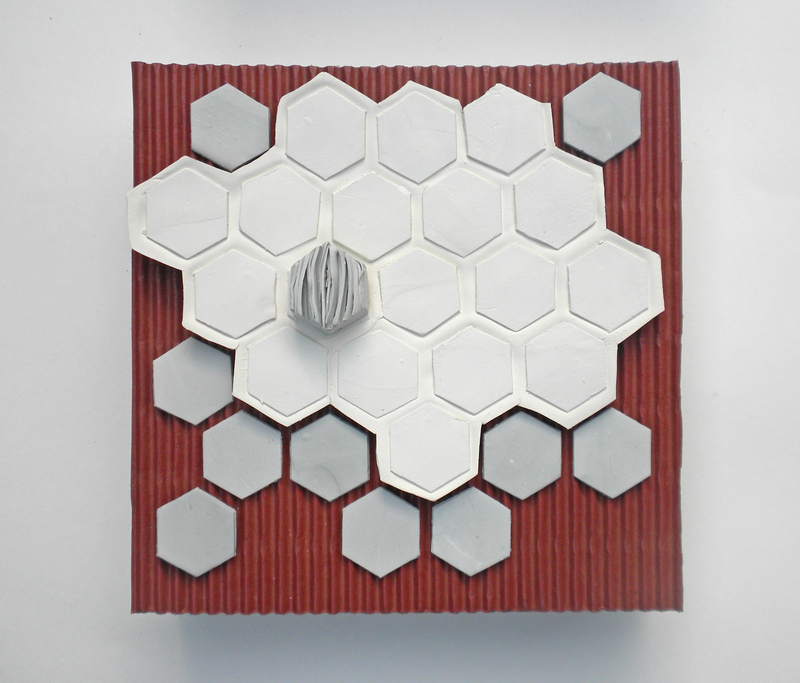 She assembles the components to create a piece that talks to her overall theme and ideas clearly or abstractly. When asked which artists she most enjoyed, it was no surprise that she said that she was a huge fan of Roy Lichtenstein and Claus Oldenburg. She loves the “crisp lines and fun/drama aspect of both their work.” Both iconic artists have a terrific sense of fun as they toy with our sense of what is real and inspire us to wonder. Lichtenstein is particularly famous for his “Pop Art” enormous canvases that appear to be pulled from 1950s comic books, and Oldenburg creates enormous sculptures that resemble everyday objects (a safety pin, a badmitten birdie, lipstick). Their clean designs, wondrously oversized placement, and amusing choices pull a viewer in for pure pleasure’s sake, and then leave us asking questions. 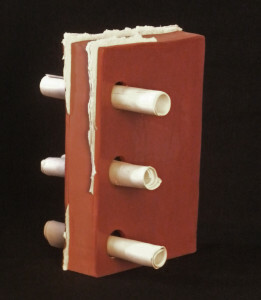 In “Ream Scrolls”, she puts thin sheets of rolled up white clay into three holes in a rectangular terracotta form; within the red clay form Emily imbeds hand-pressed white paper. This play between “real paper” and clay paper that looks like paper, forces you to think about what is real and what is not, and what the artist is getting at. The red brick resembles a book, but the holes through the “book” make the piece seem more like a brick where secret scrolls are hidden away. In either case, the answer of course is that it is not a brick or a book, or pages to a book or secret scrolls, it is a piece of art, and like much contemporary art, it forces the viewer into a conversation that can be as profound or trivial as the viewer wishes to make it. From the question “is that real paper?” to “what is real?” there are very few local artists out there that make the dialogue worth pursuing, and Emily is one of them. If you would like to see Emily’s work face to face, she will be showing at Galer Estate Winery for this Thursday’s Pop-up Artist Show from 5-9pm to benefit The Chester County Art Association’s New Building Fund. She is also a frequent exhibitor at Chester County Art Association shows, The Art Trust in West Chester, and Blank Canvas Gallery in New Hope. Please check out www.clayrocket.com for an updated list of her shows. Local Art Watch highights one local artist every week. Lele Galer is an artist who has chaired numerous art shows, taught art history and studio art, public art and has chaired, written and taught the Art in Action Art Appreciation series for the UCFD schools for the past 12 years. She worked at the Metropolitan Museum of Art, and wrote for the Asociated Press in Rome. She has been dedicated to Art History and art education for most of her adult life. Lele and her husband Brad own Galer Estate Winery in Kennett Square and she is President of the Education Foundation and co-Chairs the CCAA’s New Building Campaign.